(by Lee Cowan, CBS News) – …Music legend Quincy Jones, 83…has worked with the likes of Michael Jackson, and has 27 Grammys to his name, as well as an Oscar. But Jones’ latest task is pretty daunting. 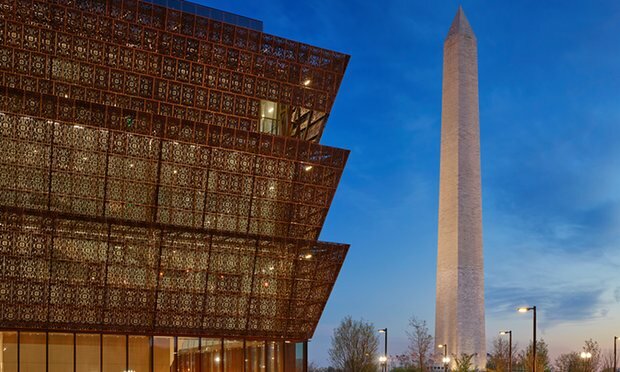 He’s producing the dedication ceremony for the opening of the Smithsonian’s National Museum of African American History and Culture (NMAAHC). The story he has to tell is nothing short of the tale of black America. As many as 20,000 people are expected to descend on the Mall to watch President Obama cut the ribbon at the dedication ceremony on September 24th. Jones is on the museum’s council, and has been working closely with founding director Lonnie Bunch to help collect items of both musical and cultural significance. 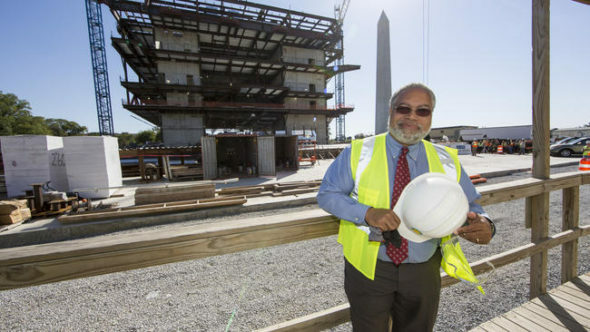 Lonnie Bunch, founding director of the Smithsonian National Museum of African American History and Culture. The museum’s 11 massive galleries display, in total, more than 30,000 priceless artifacts. There’s a lot of space to fill — the museum is 400,000 square feet, 60 percent of which is underground. The lower floors present a darker tale — a segregated rail car; shackles used to enslave a child; and the casket of Emmett Till, the young boy whose lynching in 1955 helped spark the civil rights movement. And there are the stools from a Woolworth’s lunch counter where black students were refused service, and so refused to leave. But make no mistake, Bunch says: This is not (nor was it ever intended to be) the National Museum of Discrimination. “For me, the African American experience is an experience not of tragedy, but of unbelievable belief — belief in themselves, belief in an America that often didn’t believe in them,” he said. There’s also Chuck Berry’s ‘73 Cadillac, Carl Lewis’ Olympic medals, and Muhammad Ali’s boxing gloves. “We had to say, let’s tell the story and find the balance between the stories that are going to make you cry, and the stories that are going to make you smile,” Bunch said. Which is why Quincy Jones makes such a valuable resource for Bunch. He, like so many others, have succeeded in the face of enormous obstacles. “When you come from the bottom, you never forget it. Never,” Jones said. He was born in Chicago in what he calls one of the biggest black ghettos in America. He lived for a time with his grandmother, a former slave, and — while touring the South with jazz great Lionel Hampton — experienced first-hand the sting of racism. “We get to the biggest church in town, from the steeples of one of the big churches there, they had a rope and an effigy of a black dummy hanging off the top of the steeples,” Jones said. “You remember that to this day?” CBS’ Lee Cowan asked. “Hell, how you gonna forget that?” Jones replied. It wasn’t until 2003 that President George W. Bush signed bipartisan legislation getting the ball rolling. But it would be another nine years before construction on the museum began…. Perhaps it already has. …..
1. How is music legend Quincy Jones involved with the National Museum of African American History and Culture? 2. When is the dedication ceremony for this latest Smithsonian Museum to open? 3. a) Who is Lonnie Bunch? b) According to Mr. Bunch, what is the museum NOT intended to be? c) How does Mr. Bunch describe his view of the African American experience? b) How many artifacts are in the museum’s 11 galleries? c) Describe the differing artifacts mentioned in this article. 5. a) In addition to Mr. Bunch, who else was instrumental/responsible for getting this museum commissioned? b) Which president signed the legislation needed for this museum? c) What is Mr. Lewis’ hope for the museum? 6. These men focus on how far we’ve come as a nation, and on the strength, optimism, perseverance and resilience African Americans have had. What is not mentioned in this article, but is well known, is the strong faith the African American community has in God. When asked by someone in the book of Matthew, “which is the greatest commandment?” Jesus said to him, “You shall love the Lord your God with all your heart, with all your soul, and with all your mind. And you shall love your neighbor as yourself. On these two commandments hang all the Law and the Prophets.” What do you think would happen with race relations in America if everyone followed these commandments “love God…” and “love your neighbor as yourself”? Lonnie G. Bunch III (born November 18, 1952) is an American educator and historian. He has spent much of his career as a history museum curator and administrator. He is the founding director of the Smithsonian’s National Museum of African American History and Culture. Bunch previously served as director of the Chicago History Museum (Chicago Historical Society) from 2000 to 2005. It serves as a place of collaboration that reaches beyond Washington to engage new audiences and to collaborate with the myriad of museums and educational institutions that have explored and preserved this important history well before this museum was created. from CBS News: Mr. Bunch says as much as 80 percent of the museum’s artifacts were donated by ordinary people who pulled them out of their basements, their attics or their churches. Each item in the museum’s collection tells a story — some of a tortured racial past, others of resiliency and optimism.